All we support the king of bassist Billy Sheehan! Please check the services, fill the blanks, and push "register". E-mail addresses are used only for these services. You will receive a confirmation e-mail usually within a week after registration. "Influences and Connections" will be released. 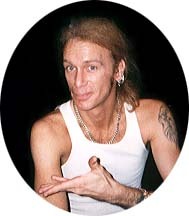 Billy played on "Mr. Big". Derek Sherinian's "Black Utopia" was released on April 15th. Billy played on "The Sons of Anu", "Axis of Evil" and "Black Utopia". Billy played on Glenn Hughes's new solo album. Billy played with Paul Gilbert and Gary Cherone at Viper Room in LA. Richie Kotzen's new album "Change" will be released on March 19th in Japan. Billy played on "Out Take" and Pat Torpey played on "High" and "Out Take". Richie Kotzen's new album "Change" will be released on March 19th in Japan. Billy and Pat Torpey played on the bonus track. A long Interview, message movies, and more. DVD "B'z - Beautiful Reel" was released on November 17th.